Put the artifact on display. This artifact has been restored to a remarkably excellent condition. 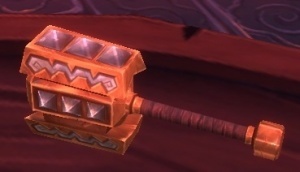 Perhaps you will put it on display at the Seat of Knowledge, so that lorewalkers and archaeologists can study it. Remove the clutter and put the artifact on display. Put the artifact on display at the Seat of Knowledge. This will aid lorewalkers and archaeologists in understanding the history of Pandaria.